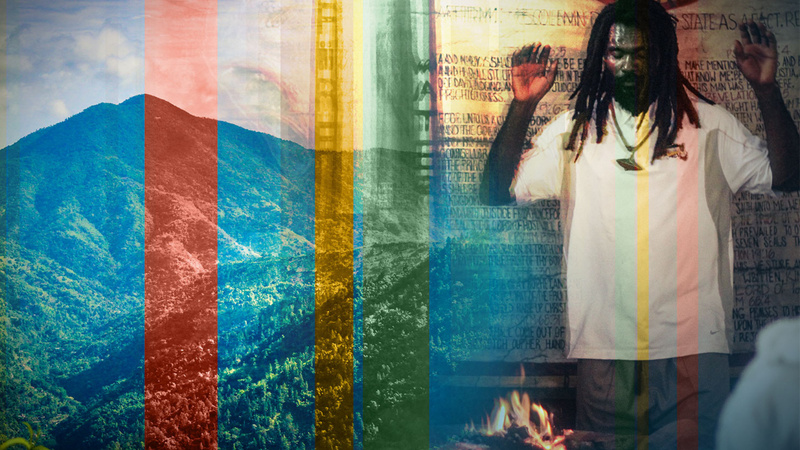 Had I made a list of all the thoughts I expected to run through my head as I stood barefoot in the dirt during a Rastafari ritual in the peaks of Jamaica's Blue Mountains, 'I know that song' probably wouldn't have troubled the top ten. But as I cast aside any awkwardness to dance to the pounding of 15 or so drums, I get the feeling that I do. It's a few seconds before I realise this isn't just my mind playing tricks – I actually do recognise the song that's being chanted among the drumming and the wild but languid dancing. It's Lady Gaga, and it's followed by excerpts from Heavy D and the Boyz' 'Now That We Found Love' and – of course – Rick Astley's seminal classic 'Never Gonna Give You Up'. No, really. It's only after the ceremony has been wrapped up that I realise there's no reason why the Rastafari commune – known as the School of Vision – should be in complete disconnect from the rest of the world – or, evidently, from one-hit wonders of the '80s and '90s. It's slightly less than an hour by car from Kingston, and the journey's only that long because of the tiny roads that snake their way up the mountain passes. In fact, gazing at the breathtaking view over Kingston – spectacular in daylight but even more so lit up at night – suggests that Jamaica's capital city isn't as far away as it feels. The distance, metaphorically speaking, only seems so great thanks to the overwhelming feeling of seclusion. 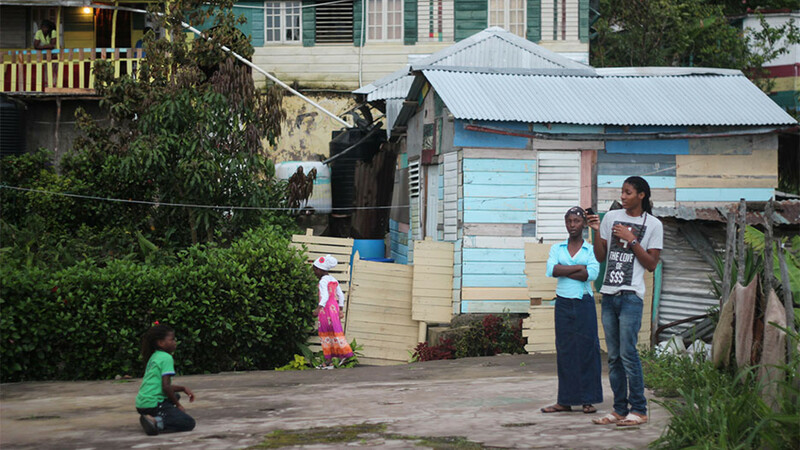 It's a far cry from teeming streets or tourist beaches. For many, that vision of Jamaica – of palm trees, white sands and coconuts, piña coladas and rum punch on the beach or snorkelling in shallow blue waters – is the dominant one. The country has all those things, of course, if they're what you want – but to me, they're not Jamaica. To me, Jamaica's beating heart may as well be those drums and the throng dancing to them. It's the Blue Mountains. It's coffee. It's music. Up in the commune, I've got two of those three bases covered (the coffee has to wait until tomorrow). And after a speech from the high priest to mark the culmination of the Nyahbinghi ritual, I-and-I, a particularly smiley member of the congregation, makes me realise my naivety when he tells me that although some of the community live in hand-built houses metres from the school's centre and farm the land, there are plenty who live in and commute from Kingston. In fact, Selassie, the teenager who guides us back down the mountain trail to our guesthouse (a task made that bit more tricky by both the fast-approaching twilight and the second-hand cannabis fumes I've spent the last hour and a half breathing in) is lighting the way with an iPhone while simultaneously playing music on it. It's not reggae or tribal drums and chanting, but contemporary US hip hop. It may not have the weird factor that Kopi Luwak – civet coffee – has, but there's no doubt that Blue Mountain coffee is among the best in the world. Served black with a drizzle of honey, it's beautifully smooth and rich. Hearing that, the pop culture references make more sense. Some of the kids go to school in the capital, and some of the adults work there and come up just for the ritual on the Sabbath. They have phones; they use the internet. Of course they do – they're as connected to the world as anyone else. I suppose it's tempting to think of Rastafari, a movement that worships a Biblical vision of God as Jah and holds emperor Haile Selassie I of Ethiopia as the true Messiah, as distant and exotic; to trivialise it with images of smiling, stoned Rastas dressed in red, yellow and green. In my surprise at the community's grasp of pop culture from the last 30 years, I'm probably guilty of having a similar – and equally naive – misconception. 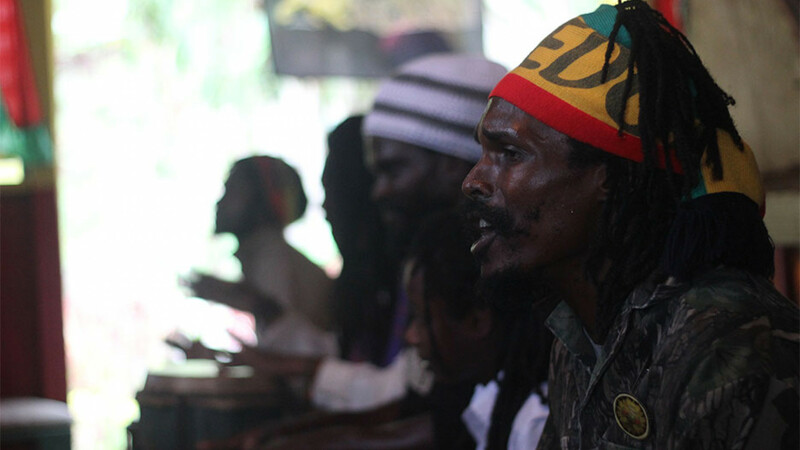 Some people estimate that only around 1% of Jamaica's population are Rastafari, but others claim more than 100,000 of its 2.8 million people class themselves as such, along with thousands of others around the world – in part down to Bob Marley's influence as the highest-profile figurehead for the movement until his death in 1981. Regardless of whether you class it as a religion in its own right, which borders on the mainstream, or a movement followed by an enlightened few, there's no novelty to be found here. Full of heatwaves and marijuana smoke from a flaming barrel, and backed by the sound of pounding drums, the room is a centre of spiritual intensity. 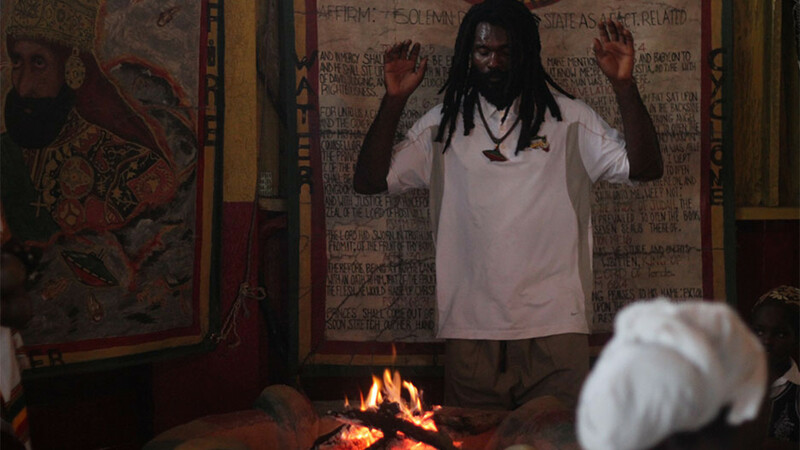 It's the first time I've seen a Rastafari ritual at first hand, although I've been to these peaks before (on a family holiday when I was seven). 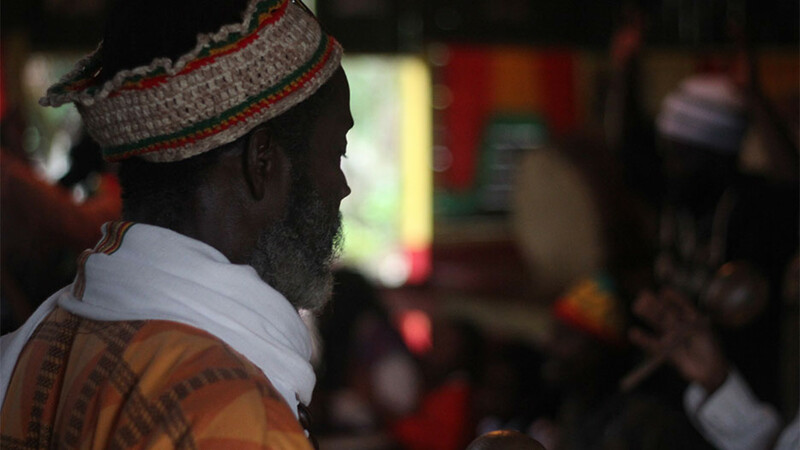 I was raised on reggae, with a father whose frequenting of south London dancehalls in the 1980s fostered a love of Jamaican culture that he passed on, and who took us to Jamaica as soon as the opportunity arose. I can recall, hazily, memories of fruit punch and snorkelling. 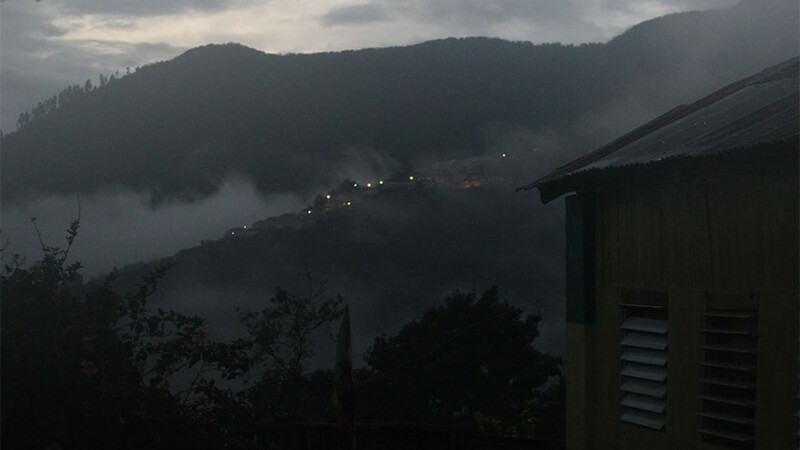 But what stuck with me were memories of mountain hospitality and, even more strongly, the taste of Blue Mountain coffee. At a tiny house perched high above rolling valleys, with a spectacular view across the plantations, I get to try that famous coffee again. I meet the elderly woman who has been selling the best in the land for decades and – of course – I absolutely have to try some. First, I crunch beans ranging from mild to strong, then an extra-special roast that's been aged for five years, before trays of mugs containing hot, strong, black coffee with spoonfuls of honey (which must have replaced condensed milk as the way to drink it in the mountains since I was last here) are brought out and eagerly drunk. If I were worried that the taste wouldn't live up to my memories, I really needn't have been. You can keep your Kopi Luwak – for me, there's no better coffee than this anywhere in the world. The drawback? The bag of beans I brought home with me is getting perilously close to running out, and it's a long way to go for a top-up. If you're going to Jamaica for more than just sun, sea and sand, This is Jamaica can create an itinerary that takes you from Montego Bay to Kingston, up to the mountains and back again. The company was founded by Tamia Harker, a travel enthusiast and graduate of the Branson Centre, who describes it as a “no-hassle, personal experience of Jamaica”. It lives up to that description, too: there are no complex guide books and no unnecessary frills at all – just an involving, vibrant and real look at this beautiful country. I've ticked off the music, and I've definitely taken care of the coffee. Thankfully, the final piece of the jigsaw – the mountain hospitality – isn't far behind. Hand-built into the side of the mountains is Mount Edge, a guesthouse where labyrinthine networks of stone paths weave and wind under trees, between wooden sleeping cabins and – if you're not careful – off the edge and down the rolling hills. If the School of Vision felt secluded, Mount Edge feels frozen in time. 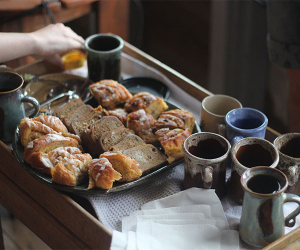 I'm not surprised when Robyn, our host and the owner of the house, its restaurant and farm, tells us that she regularly gets guests staying for weeks at a time so they can sit on its tranquil wooden balconies and write. I imagine it's the kind of place where you don't just forget what day it is – you stop caring altogether. My room has a floor-to-ceiling window that I don't notice when I drop my bags off but which, upon returning after a spectacular dinner, floods the room with moonlight and provides an ethereal view across the mountains and beyond that is so spellbinding I can barely bring myself to leave it and turn in to go to sleep. It's a fitting end to a day and a half that has often been surreal. But as I get into the minibus that's heading back down the mountains to Kingston and then on to Montego Bay, I'm glad. I got to dance with Rastas; I tasted Blue Mountain coffee when I was old enough to really appreciate it; and I drifted off in a place that was unlike anywhere I've ever stayed. But mostly, I'm glad that my Jamaica is still, pretty much, exactly as it was when I left it.